Neither Tina or I have a SONIC near us, so we "hired" my the fab duo of my sister and her boyfriend to do the dirty work for us...Payment was a date to SONIC on the $20 gift card the folks at SONIC had sent and all they had to do was write a short review. Sister Arianna went above and beyond...Thanks, A and Troy! Thanks SONIC for the gift card. Read to the end for a chance to win a SONIC gift card yourself! Who needs flowers and candy on Valentine's Day?! My boyfriend and I had a very romantic Sonic date to celebrate the holiday. We drove down to the Sonic in Wallingford, CT for our special night. Ever since discussing the idea earlier in the day, we’d both been really looking forward to our meal. We arrived and took our time perusing the menu, before making our final selections. We wanted to get a meal (me: veggie burger (I love Sonic’s veggie burgers!) and cheesy tots; Troy: a Philly cheesesteak and Ched ‘R’ Peppers), but our real purpose was to scope out the Chocolate Cherry Sweetheart Shake for Scoopalicious! We ordered that last...and the girl taking our order told us she was so sorry, they were out. She eagerly volunteered to make us a cherry shake with chocolate syrup or another sort of chocolate chips, and I just figured we’d have our meal and (what a shame) have to come back to Sonic another time. But Troy decided to explain that it was imperative that we get that shake like the one in the poster, because we were writing a blog post about it. -- Well, that changed things! Our amazing order-taker, Sydney (already having proved her merit by offering to make us her best equivalent shake) then said she’d place the rest of our order, and see what she could do about getting her hands on some of those chocolate chips! Apparently they searched high and low, and finally located some in the back of the top shelf of the fridge. Hurray! 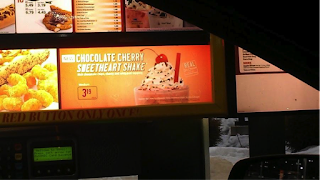 The Sweetheart Shake adventure was back on. The view from our car window! Our server Lindy came to the car with our food, and we had a great conversation with her about the veggie burgers and the work our boyfriends did (I believe hers was a glazier; Troy is a union ironworker). After the delightful conversation, we hungrily tore into our food, saving the shake for last. When we’d eaten, it was time for dessert. 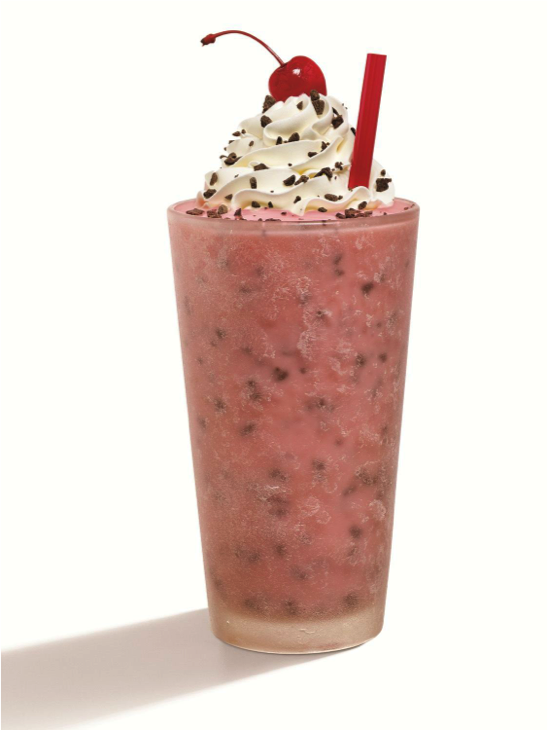 (The cherry on top, just like the one on our shake!) We both stuck a straw into the cup and tried it at the same time. It was divine! Which is especially amazing, since I’m normally not a big chocolate or cherry fan. But, so delicious. The flavors balanced so well; neither was too overpowering. 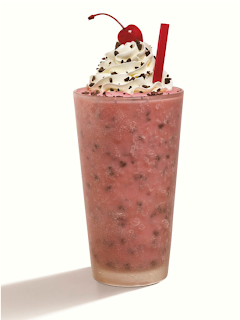 The chocolate chips were a brilliant idea, because they added just the right amount of chocolate to an otherwise cherry shake. The whipped cream was maybe the best part. All together, it was the best dessert I’d had in a long time! We ordered a large shake. Looks yummy, huh? 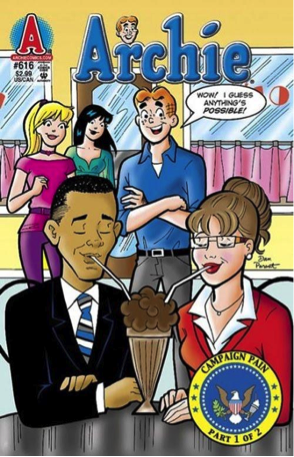 We did have one problem with the shake, if you could call it a problem: we ended up finding that spoons did a better job than straws! The shake itself was very thick, making drinking it through a straw already very difficult (especially because we were enjoying it, and wanted MORE, QUICKER!). But also, the chocolate chips - as awesome as they were! - just kept getting stuck in the straws! It was drinkable, and I wouldn’t be upset if someone gave me one while I was driving and couldn’t use a spoon, but it was just something we noticed. I would suggest asking for a spoon when you order. All in all, we were fans. 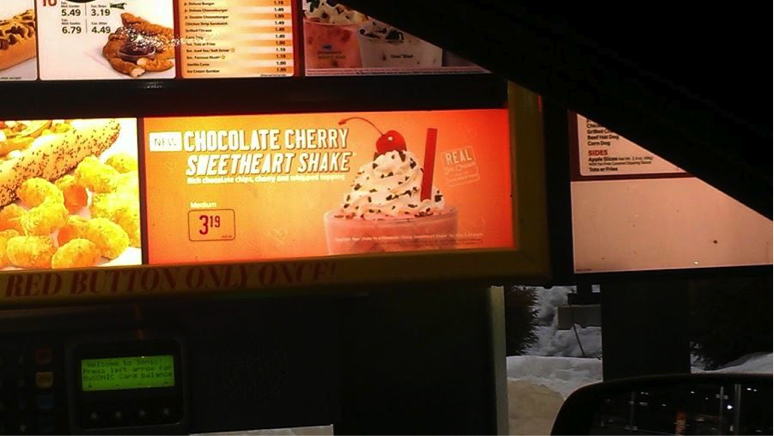 I’d definitely order the Sonic Sweetheart Shake again. 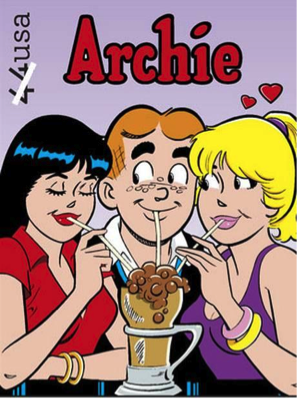 A and T, thanks for spending your Valentine's day at SONIC and enjoying a real Archie moment! BEST dessert you'd had in a long time?! I guess it wasn't too much of a pain for you to have to go for us then...Thanks T for explaining the situation and thanks to Sydney for searching high and low and allowing this post to come to be! 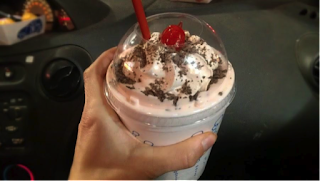 I visited SONIC's site and it looks like they are done selling their Sweetheart Shake (maybe next year?!) 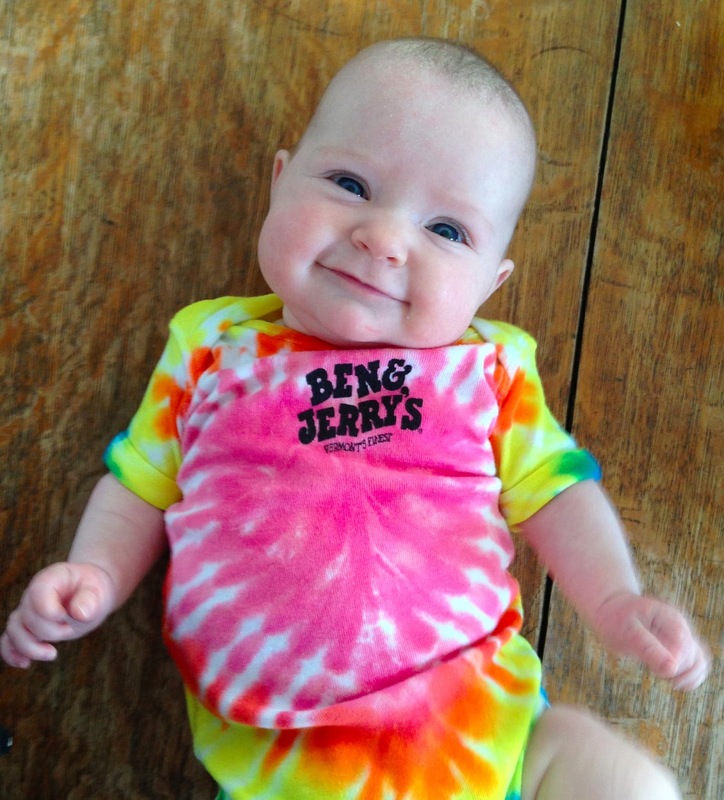 -- in the meantime, check out their menu (ice cream or other) and enter to win a $20 gift card. Liz Lemon. I want to go there. I have a small crush on Tina Fey. I think she is a smart, funny, intelligent woman. She's gorgeous but humble. She's an excellent role model for young women. I love her on 30 Rock -- so sad it ended. One of my favorite movies is Mean Girls -- it's so defining of girl culture. (And I am totally thrilled that Fey and her husband are working on a musical of Mean Girls). I couldn't stop listening to Bossypants. In fact, it was one of those books that actually made me want to go to the gym so I could listen and once I was there, I'd do a few more minutes on the stair machine just to be able to listen to a little bit more of the book. And you know Tina-of-this-blog (as opposed to Tina Fey) and my love affair with Ben & Jerry's (note exhibit A. I even dress my children to play the part of major fan! )...so when Ben & Jerry's announced Liz Lemon...I wasn't surprised, because while driving to downtown Burlington with some other bloggers and some Ben & Jerry's peeps when I was at Ben & Jerry's last year, I suggested Liz Lemon ice cream. My idea got pooh poohed, but I have a feeling they only did that because it was already in the works -- that, or they had already gotten that idea from tons of other fans. I mean, 30 Rock and Ben & Jerry's is a match made in heaven and Liz Lemon lemon flavored anything is a gimme. 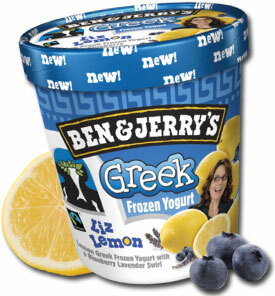 I wasn't upset I didn't get credit for my (and undoubtedly thousands of other peoples') idea for Liz Lemon Ben & Jerry's. In fact, I was incredibly bummed neither of us on the Scoopalicious team could go to NYC for the launch of Liz Lemon Greek Frozen Yogurt. This would have been awesome. [Sometimes it's hard to be a blogger from Boston, and not NYC. We couldn't make it down for Jimmy Fallon's flavor launch either, and I ♥ Jimmy Fallon as much as Tina Fey (I always kind of thought they should get married...)] But I digress. So naturally, I had to buy it when I saw it on the shelf. I'm kind of an ice cream girl above all else (frozen yogurt isn't my frozen treat of choice) but I have to say, I was pleasantly surprised. It's simply lovely. It's not too tart. In fact, it's incredibly refreshing. The blueberry lavender that runs through it is a sweet treat to offset the lemon. It's creamy and it was a nice change of pace to have Ben & Jerry's without the chunky mix-ins. Not us...we'll take a chocolate fudge shake for our halftime snack!